Means that all following branches in the process will no longer be executed (such as links to multiple filter conditions). This setting only has an effect on subsequent processes and included processes. With this setting, the process will be run to the end of the current data record. 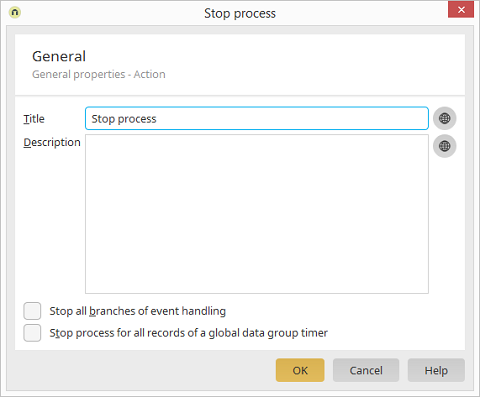 For all subsequent data records from the data record group defined in the global timer, the process will not be executed. If the parent process is time-controlled and a Stop process action is executed in a subsequent process or included process, this setting will also take effect on the parent process.